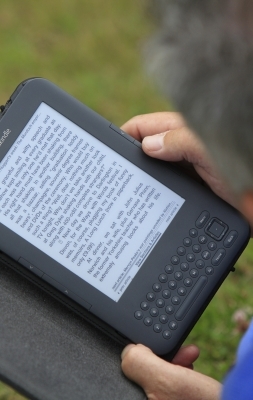 There has been a fair amount of talk about digital books. I have always firmly planted myself in the ‘traditional books’ camp. Before Christmas, my husband bought himself a Kindle, which aroused my curiosity in digital books. I thought they would come in handy for rare books or out of print books, so I asked my husband if he could get me one. When my Kindle arrived, my husband and I went through the Kindle store looking for books for me to buy. My husband was beginning to lose his patience with me because I could not come to any quick decisions. Like any good bookshop, I was inundated with too much choice. He was beginning to question his decision on buying me a Kindle after all. When I finally decided on something I couldn’t stop, so that my husband complained I was spending too much and it wasn’t ‘play’ money. Clearly, I was damned either way! I bought about six books and have so far finished reading one. It has taken me a little while to get used to finding my way around and I’m still no expert, yet I would have to admit, I’m not so against digital books as I originally had been. With the Kindle, there is no glare, you can change the font size, it’s environmentally friendly and it’s so handy to fit it in with your luggage rather than a couple of books taking up valuable space. I can’t exactly put it on my bookshelf though, so I would need to know what books are on it. My husband is currently buying books he already owns for the Kindle and I might resort to doing that myself one day. I now have my feet firmly planted in both camps; however, I would have to admit you can’t go past the traditional book form. Digital books certainly have its uses, yet they don’t have the same feel or smell of a traditional book. It’s still early days for me yet. If you own a Kindle, I’d like to know what you think. Next Post Defining Your Goals: Learning to Say ‘No’.